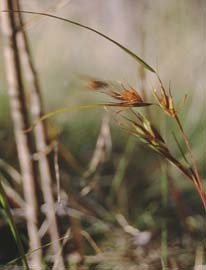 Themeda triandra is one of Tasmania's most common and recognisable native grasses. It is a dominant species in native grassland and grassy woodland, though its abundance appears to have declined through grazing by sheep. 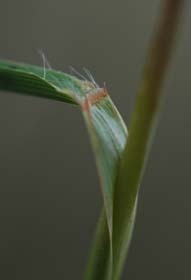 It is a moderate sized grass with flat leaves a few mm wide, at the base of quite tall (up to 1m), erect flowering stems. The inflorescences are are at the ends of the branches, tend to be nodding. Each inflorescence has a large, bract subtending it.